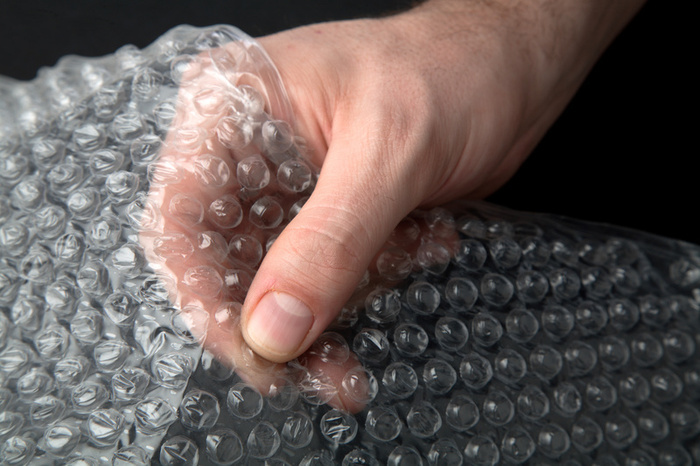 Today is Bubble Wrap Appreciation Day! January 27 marks the annual bubble-popping event that originated from Spirit ’95 FM Radio in Bloomington, IN. We all know this fun and practical packaging material that comes in various sizes and colors to protect our fragile and beloved items, but most of us don’t realize that its purpose was originally to be wallpaper! In 1957, engineers March Chavannes and Al Fielding wanted to create a plastic and textured wallpaper. They soon realized the potential the material had as packaging supply and it quickly took off. Nowadays Bubble Wrap isn’t just the favorite packaging material for keeping delicate items safe and protected from damage, it is also used for art, fashion, and even in a competition for young inventors that challenge them to use Bubble Wrap to design innovative products! The process of making Bubble Wrap is not as simple as it seems. The cushioning property starts as a plastic resin that melts into a liquid as it is squeezed over two sheets of plastic film. One of the layers is then wrapped around a drum where holes are then drilled into it. After that suction draws the two plastic films together and trap the air to form bubbles. This whole process constructs the fascinating and fun packaging material that we all have come to love and use. So grab some Bubble Wrap and pop some of those bubbles of air and celebrate Bubble Wrap Appreciation Day!